Every day, your local dentist is helping patient overcome tooth pain. How they’re doing that depends on what is causing the pain in the first place, though. Tooth pain has a variety of causes, with cavities being one of the primary examples. Cavities are the result of decay, which is itself the result of demineralization. Here’s how the demineralization process works. First, certain kinds of bacteria in the mouth come into contact with sugar or another carbohydrate. Those selected bacterium begin to feed on that carb, creating an acidic byproduct. Both cling to teeth, eating away at the protective outer layer known as the enamel. If the demineralization process continues, small holes will form in teeth, exposing the sensitive inner layers of dentin and the nerve. 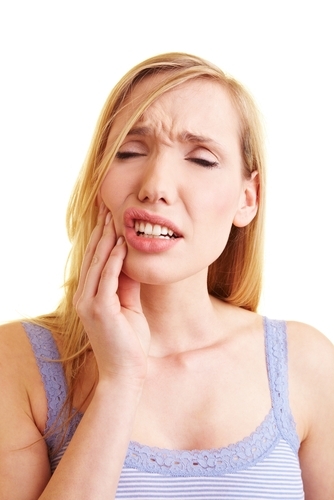 With tooth sensitivity, the situation is similar though the cause is different. Often, tooth sensitivity occurs where the gums have receded, exposing part of the tooth’s root. Here there is little to no enamel, meaning that the hot or cold foods and drinks you consume are likely to come into contact with the porous layer of dentin and the nerve underneath. In other cases, pain may be caused by a tooth that is cracked, chipped, or has developed an abscess. So, how will your doctor treat your pain? In the case of a cavity, a simple filling will help restore good health and functionality. For a tooth that’s broken or badly decayed, a crown may be the best solution. Other patients may need to have their pain treated with a root canal. Do you struggle with tooth pain on a daily basis? Call your local dentist for a consultation. Your doctor will talk to you about your situation and recommend a treatment that will help you achieve optimal oral health.